Sat., Aug. 12, 2017, 1 p.m.
It’s fair to say that downsizing from 10 acres to a standard city lot would be an adjustment for anyone – but especially for two dedicated gardeners. Kurt Madison and his wife, Margot Casstevens, have turned that adjustment into a learning experience that others can benefit from. Madison and Casstevens are both professional artists and fine art instructors at Spokane Falls Community College. He first became interested in gardening in the 1970s while living in Austin, Texas. After relocating to Chicago, he became certified as a Master Gardener. The couple later moved to Scotland for three years, where Madison learned estate gardening and English gardening techniques. Following that, they moved to Indiana for another three years and eventually moved to a 10-acre property in south Greenacres in 2000. They’ve been in the Spokane area ever since. Three years ago, they moved to a small South Hill lot. Other than missing how peaceful it was on their rural property, Madison is happy with the change. They have been gradually transforming the previous owner’s landscape into their new garden. First on the list was removing quaking aspen trees that were taking over the backyard. They also had a large fir tree removed and expanded the planting beds. 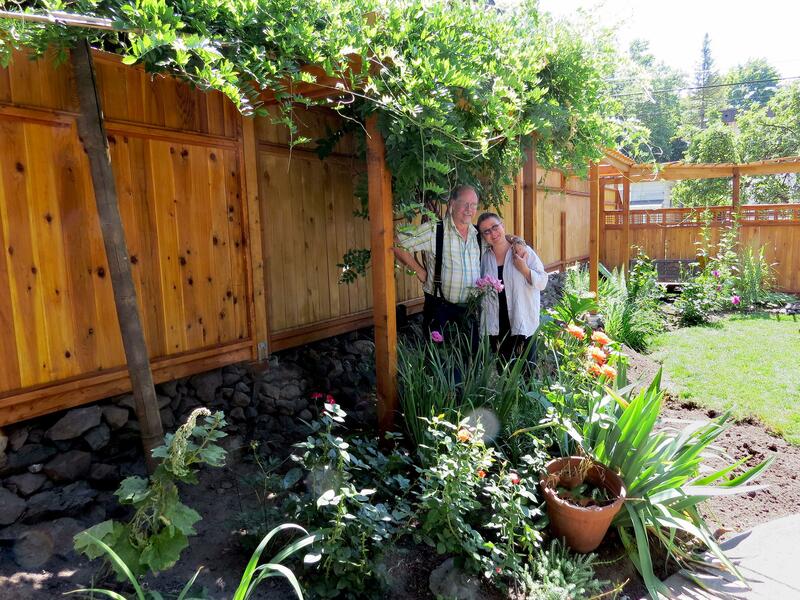 Madison and Casstevens are building an attractive fence around their backyard that incorporates a pergola for wisteria to grow on. They’ve added new plants as well. “Try to leave the existing landscape alone for a year. See what’s there. You have no idea how many tulips are in the ground and you need a year to understand what’s going to come up. However, you do need to get rid of any egregious faults such as dead or troublesome trees. “The next step is to clean the ‘lines’ of the garden such as pathways and edges of beds. That doesn’t necessarily refer to straight lines; it could be rounded or undulating lines that define areas of the garden. Cleaning them up can do amazing things to any garden environment. “Eliminate plants that could be a problem or types you don’t personally care for. In addition to providing these pointers, Kurt Madison enjoys doing garden design consultations. He can be contacted via email at kraymn@icloud.com. Susan Mulvihill is co-author of “Northwest Gardener’s Handbook” with Pat Munts. Contact her at Susan@susansinthegarden.com and follow her at facebook.com/susansinthegarden. View this week’s “Everyone Can Grow A Garden” video at youtube.com/c/susansinthegarden. Published: Aug. 12, 2017, 1 p.m.